I've compiled a list of some of the places I've visited recently with a quick review for each into one handy blog post. I'm not gluten free but the friend I went to most of these places with is, so I've made a point of commenting on the gluten free options too. I’m not sure I would have found Redemption if we hadn’t specifically gone looking for it but it was well worth the search. The whole menu is vegan and gluten free so you don’t have to worry about sifting through the letters at the end of the descriptions to see which dishes you can eat if you have requirements. The menu has a lot of choice and after a lot of deliberation I went for the Pulled BBQ Jackfruit Burger. I’d never tried jackfruit before I stopped eating meat and I will admit I was really hesitant as to how good a meat substitute made from fruit was going to taste but I was pleasantly surprised and now most of the time I see it on a menu I order it. It’s such a diverse thing to cook with and I’ve never ordered a jackfruit meal that has left me disappointed. Before it arrived I was slightly dubious about the gluten free bun it came with but the bread was soft and I probably wouldn’t have noticed it being gluten free if it wasn’t highlighted. I ordered sweet potato fries which I probably could have done with missing out on due to the size of the giant portion of coleslaw that came with the burger but I definitely gave it a good effort. My friend Laura got the buckwheat pancakes with fruit and some of the best yoghurt I have ever tried, vegan or otherwise. My only regret is not being able to try the desserts since I ordered so much for lunch. 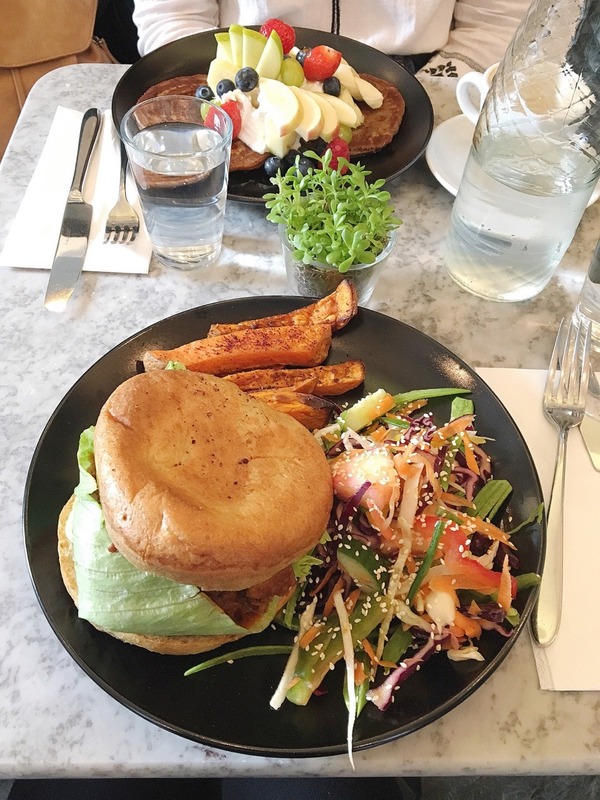 The food was really good value for money considering the portion sizes so it is definitely a place to visit if you find yourself near Shoreditch. With Magic Falafel the name speaks for itself. 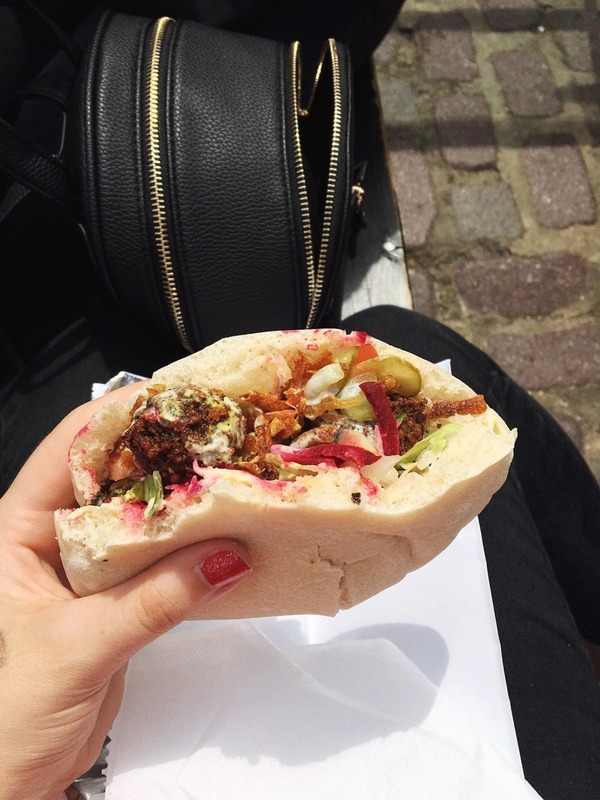 The number of food stalls in Stables Market is almost overwhelming but I had my heart set on falafel and the large queue leading away from Magic Falafel’s stall looked promising. Their sign labels it as vegan and I found this so appealing because I hate being that person who ends up holding up the whole queue by enquiring what sauces they put in their pittas and if they can leave out the yoghurt dressing. The falafel is completely gluten free but unfortunately they don’t have a gluten free pitta option so you are limited to the salad box. I opted for a pitta which was light and tasty and packed full with just enough salad and falafel and sauce that it makes for an amazing combination without it overflowing and spilling down your top as soon as you bite into it. I forgot to take a picture in my excitement to start eating which I feel is a glowing review in itself so here is a lovely shot of my pitta with a bite taken out of it. Mooshies was another place that you definitely need the help of Google Maps to locate. When we finally found it on a corner we nearly walked straight past it because they didn’t have a sign with their name on. I'm not sure if this is a temporary thing or if there has never been a sign and they're popular enough to cope without one. 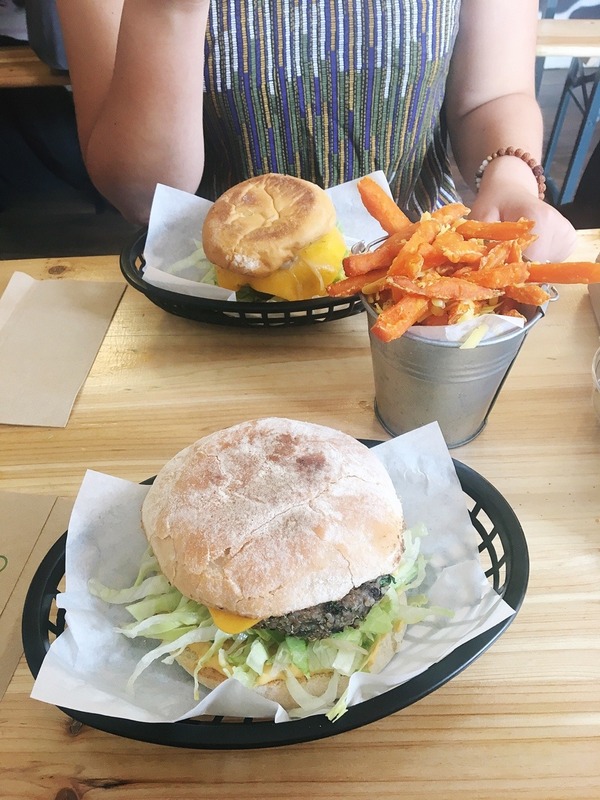 Mooshies is a completely vegan burger bar with gluten free options and bench style seating inside. The menu only features four burgers but they are all very different so although there isn’t a big choice you still have the option of a whether you want jackfruit, a bhaji style burger, a bean burger or if you want to try out the “phish” option which contains battered aubergine and seaweed. We ordered cheesy sweet potato fries to share and two of the What’s Your Beef? burgers which are made up of a black bean and quinoa patty, Mooshies burger sauce, caramelised onions, cheese, gherkins and lettuce. I feel like veggie burgers are often seen as a safe veggie option and can sometimes be a bit bland but the Mooshies burger was anything but. I am such a fast food fan and in a world of raw vegans and pulse filled salads, the burger sauce and vegan cheese really hit the spot for me. It’s such good value for money because the burgers are huge and even with sharing a side between two we were very happy customers at the end of it. 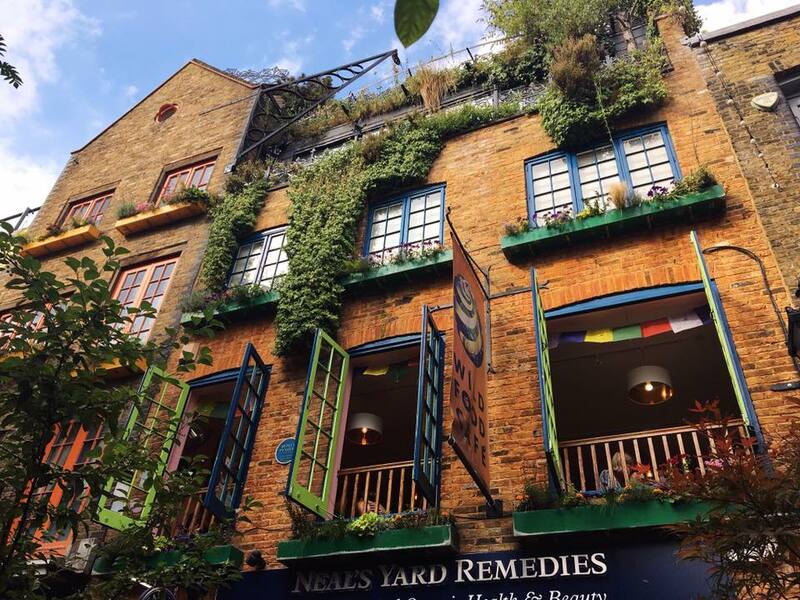 I visited the Mildreds in Kings Cross but they also have locations in Soho and Camden. The restaurant is vegetarian and they clearly label the items that are vegan and gluten free and the dishes that can be made so on request. 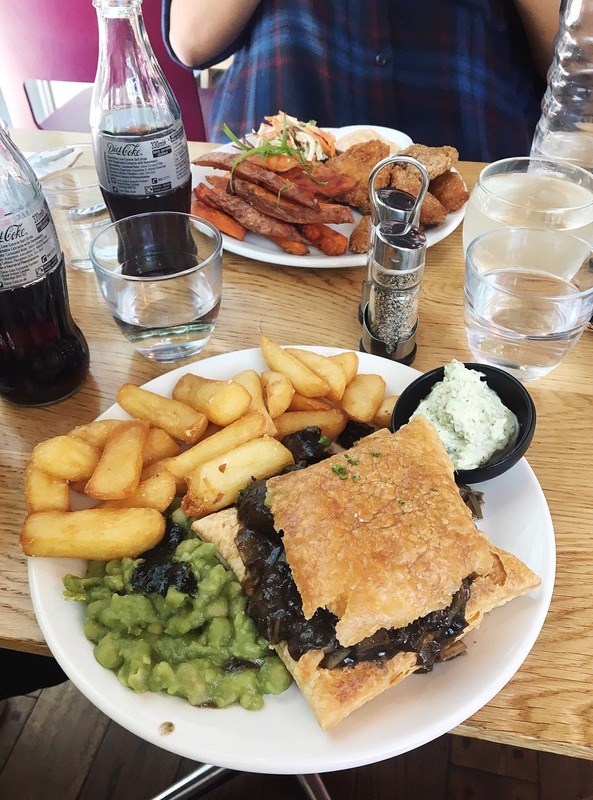 I love pastry so when I saw the wood roasted mushroom and ale pie with minted mushy peas and fries on the menu I was excited. It definitely had an interesting presentation when it arrived in the way that it kind of looked like a squashed burger but it tasted incredible so I dealt with it. The chips were fluffy and although I probably wouldn’t have ordered mushy peas if they were an added option, they made a nice addition to the meal. My friends went for the southern fried buttermilk and polenta mock chicken which I sadly couldn’t try because it was only vegetarian. I was disappointed they soaked it in buttermilk because chicken is one taste I really miss and I feel like they could have been made it vegan with very little effort but I guess you can’t have everything. I saved the best until last. Temple of Seitan is the stuff dreams are made. I really wish I could eat there every day and I regularly find myself daydreaming about it when I'm sitting at work. They have several different options whether you want a burger or a wrap or just the chicken and they can prepare it gluten free on request. The two times I've visited I’ve ordered the Temple Burger and a side of chips both times. It’s just everything I could ever want in a meal. Fried chicken in a bun with salad and bacon and mayo and the best thing about it is that it is all vegan. Just thinking about it is making me sad I don’t have one in my hand right now. The only negative I have for Temple of Seitan is that because it is so small there is really limited space outside for seating and because it is so popular both times I’ve been it’s been packed full. The first time I went we ended up sitting on a step to eat which wasn’t a problem because it was sunny and dry but it might not be so enjoyable in the winter. 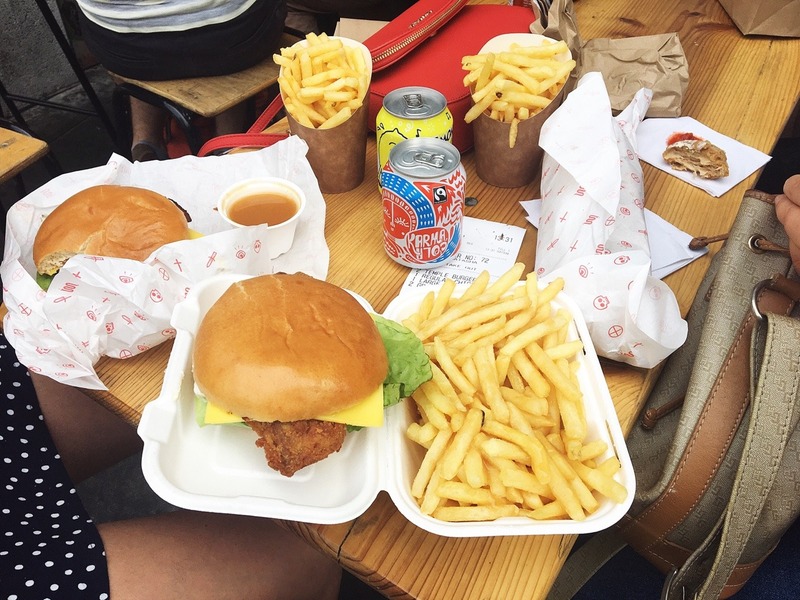 The food is so good though that I probably would still just sit and eat soggy chips in the rain. Amazing value for money and wherever you find yourself in London it is well worth the travel time to try it. I'd recommend all of these places to anyone whether your diet is plant based or not. Dietary restrictions aside, the food at all of these places is really delicious. And even if you're not vegan yourself, everyone could do with eating a little less meat in their diet and you might even surprise yourself with something new you haven't tried before. 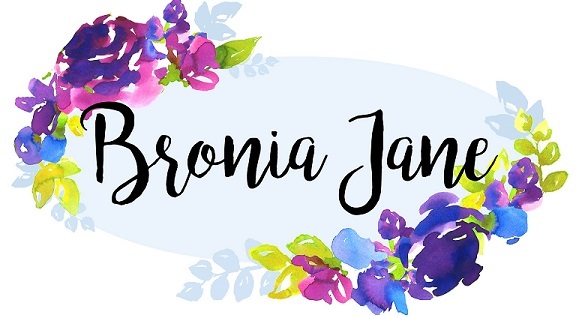 Hello, nice blog. The Mildred's polenta 'chicken' things are actually vegan. It's labelled as 'vegan buttermilk' and has the vegan symbol next to it on the menu. I tried if for the first time the other day and I have to say it may even beat temple of seitan as the best mock-chicken I've ever had. It was so goooooooooooood. Anyway, thought I'd add this in case anyone finds it useful to know.